It’s blueberry season and there’s nothing more I love than popping juicy little blueberries like how I used to pop Sour Patch kids back in middle school. In fact, I ate so many Sour Patch Kids in one day that my tongue literally peeled off. Safe to say that I’m happy I’m over my middle school candy obsession. I’ll stick with the summertime sweet blueberries. I’m sure I’m not the only one who hates cooking during the summer months. Our condo is on the fourth floor of a walkup and there’s nothing worse than the mucky, humid hot air when you turn on your oven during the sticky summer months. The only thing I can justify turning on the oven for is a batch of my tahini brownies when I get a late night sweet tooth, otherwise, give me all the NO COOK recipes! Am I right? Today I’ve got a pretty epic no cook breakfast for you in partnership with my friends over at siggi’s. I’m SUPER excited to share another recipe featuring their yogurt because they’ve been a part of my life ever since they showed up in grocery stores. In fact, Milly (my cat) used to love to eat their blueberry yogurt straight out of the container when she was little. It was ADORABLE. 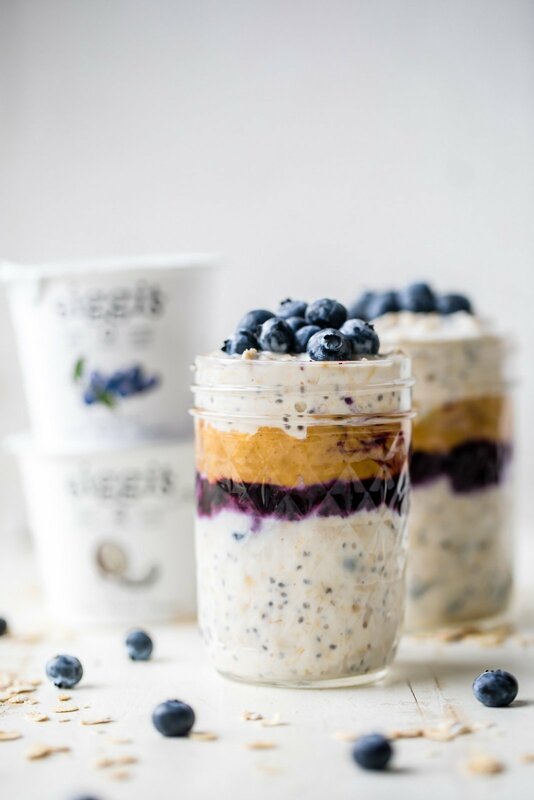 So everyone, say hello to these gorgeous Peanut Butter Blueberry Overnight Oats or as I like to call them, a fancy version of a PB&J for breakfast. What I like about these overnight oats is simple: they’re packed with protein, there’s no added sugar and taste like a peanut butter and jelly sandwich. 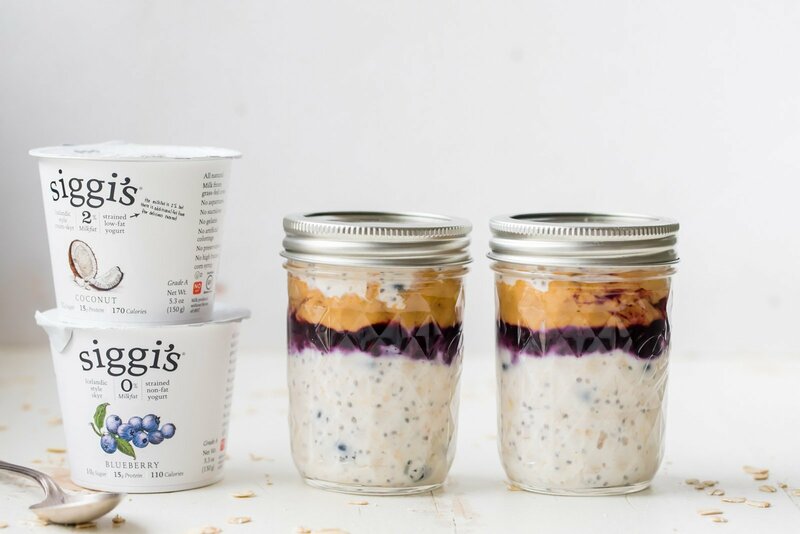 I used siggi’s coconut yogurt in these but the blueberry also works really well if you want a little extra blueberry flavor. 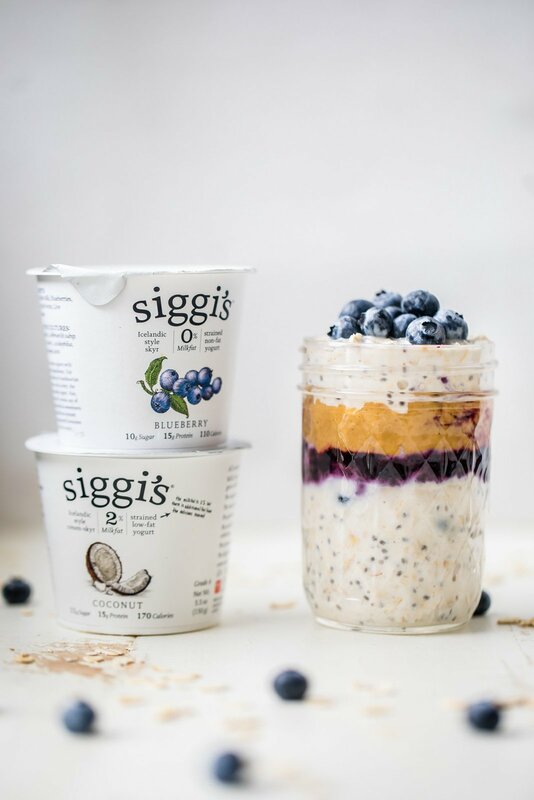 If you didn’t already know, siggi’s yogurt is made with simple ingredients and not a lot of sugar — the brand uses all natural sweeteners like fruit and agave or cane sugar. Each cup packs about 15g of protein and has about half of the sugar compared to other yogurts out there. IT’S LIT. Anyway, these Peanut Butter Blueberry Overnight Oats are my new favorite breakfast for the summer. Of course, you can use whatever nut butter & jam you’d like, but this was my favorite combo because I love how blueberries are bursting with juicy flavor this time of year. I hope you get a chance to make these soon! If you do, be sure to tag #ambitiouskitchen on Instagram and don’t forget to rate the recipe below. Xo! 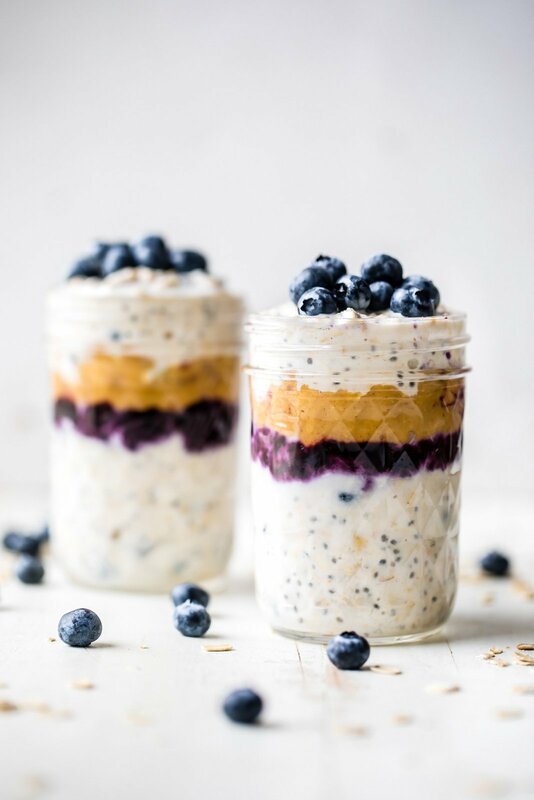 Amazing peanut butter blueberry overnight oats that taste like a classic PB&J. 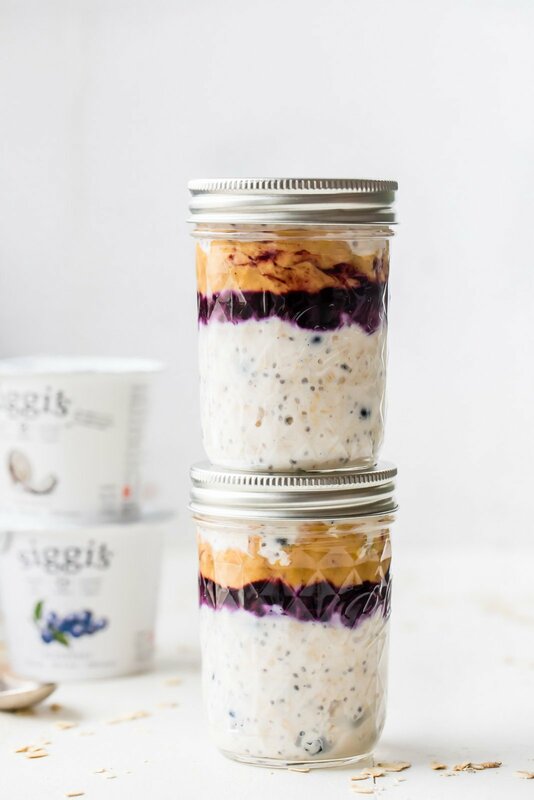 You’ll love these healthy, no sugar added overnight oats made with siggi’s yogurt for an extra boost of protein! 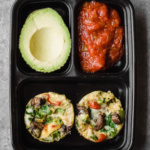 Make them ahead of time for a healthy meal prep friendly breakfast. 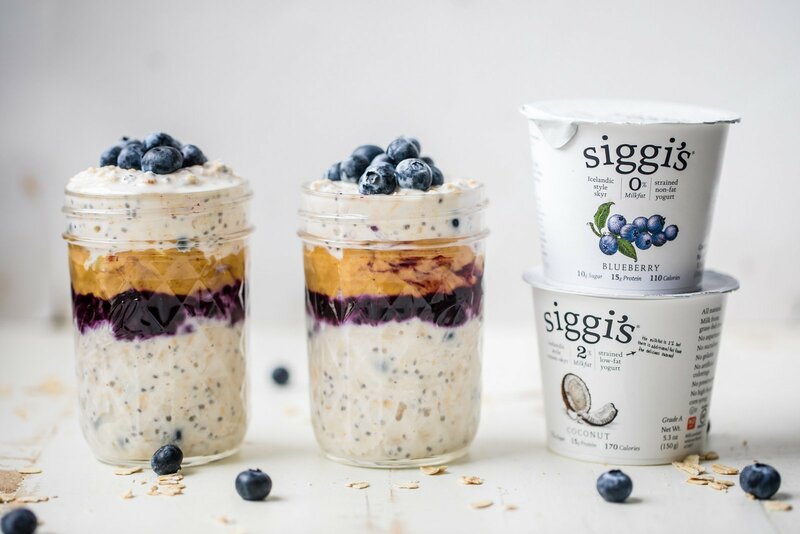 This post is in partnership with siggi’s. Add yogurt and almond milk to a medium bowl and stir until well combined and creamy. Stir in chia seeds, oats, and blueberries. Cover bowl and place in the fridge for at least three hours or overnight. Once ready to assemble, grab two 12 ounce mason jars. Fill each jar halfway full with oat mixture, then add a tablespoon of blueberry jam followed by a tablespoon of peanut butter to each jar. 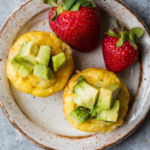 Top with remaining oats, then cover and place in the fridge for later or enjoy immediately. Once ready to serve you can top with a few extra blueberries if you’d like. Serves 2. Feel free to simply swirl in the peanut butter and blueberry jam if you don’t have time to assemble it in layers. It will still be delicious! 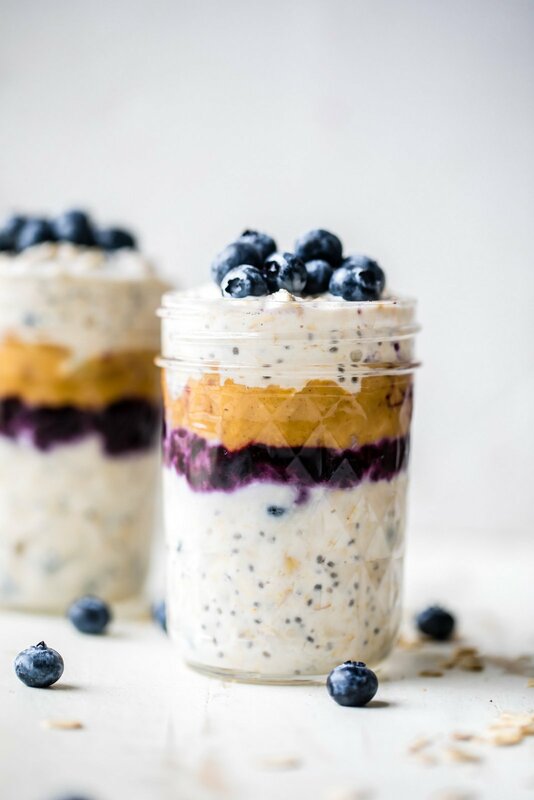 37 Responses to "Peanut Butter Blueberry Overnight Oats"
This looks so delicious! All of your recipes always turn out amazing. 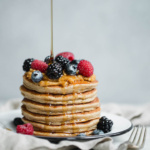 What brand of blueberry jam do you recommend that is low sugar? Thanks Lexi! I usually get it from Trader Joe’s 🙂 I think it’s their blueberry preserves! If you’re using a coconut yogurt, can You also use a coconut milk? 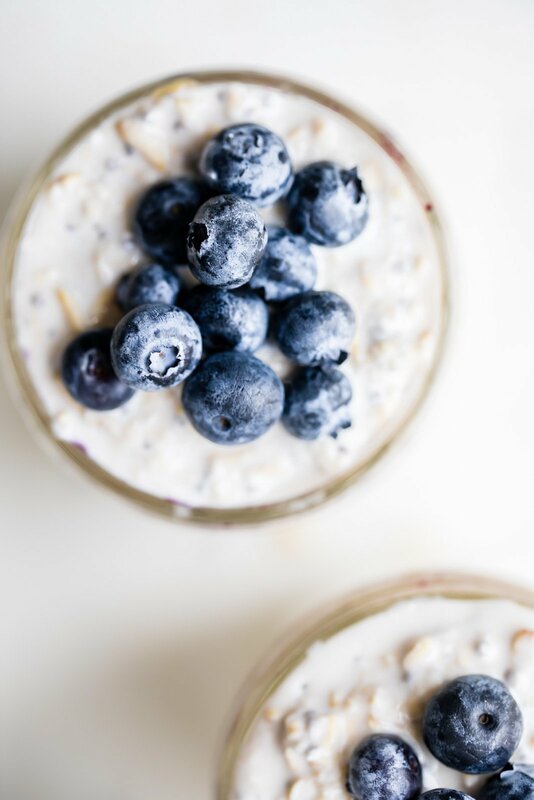 Blueberries and peanut butter are one of my favorite combos for overnight oats! My husband takes it to work a lot! I love the addition of jam! Mine too! Love these on-the-go. YUM love PB&J and how much protein are in these oats!! 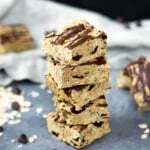 I’m with you on all the no-bake recipes for summer months! We dont have siggis in Australia so I need to find an alternative. What size is the container of yogurt please. Hi Robyn! It’s 5.3 ounces or about 150g. I am going to have to make this for my kids! I love finding ways to pack in protein without packing in extra sugar. Sometimes it feels as if we can’t have the best of both worlds so, thank you Siggi’s! Thanks for sharing! Man, I am sure that you do get a peanut butter and jelly sandwich in a jar indeed! There’s the carby-grain-bready quality from the oats and obviously the peanut butter and jelly action. 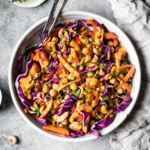 This is such a nice recipe–I would love to try it with coconut yogurt! Can’t wait to make this. Looks delish! Hi, You can’t get Siggis in Tanzania. 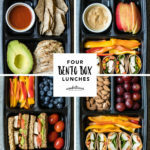 What is the container size please. It’s 5.3 ounces (or 150g)! 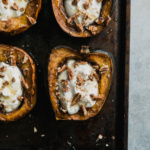 omg this is absolutely amazing recipe. i realized my jars are 8oz instead of 12oz but it still turned out to be enough! i will definitely be making this again!! Perfect!! Such a great breakfast. How long will these keep in the refrigerator, if I’m doing my meal prep on Sundays for the week? Thanks! Overnight oats last for 3-5 days in the fridge! They’ll just get softer the longer that they sit. This looks delicious but unfortunately we are a nut free/peanut free household. Any suggestions what else we could use as an alternative to replace the peanut butter?